The barn is constructed of stonework with slate roof and is suitable for conversion to a single detached property subject to the necessary planning permissions and building consents. The property is situated in an elevated rural position with spectacular long-distance views to the Hodder valley and fells beyond. land extending to approximately 12.4 acres. 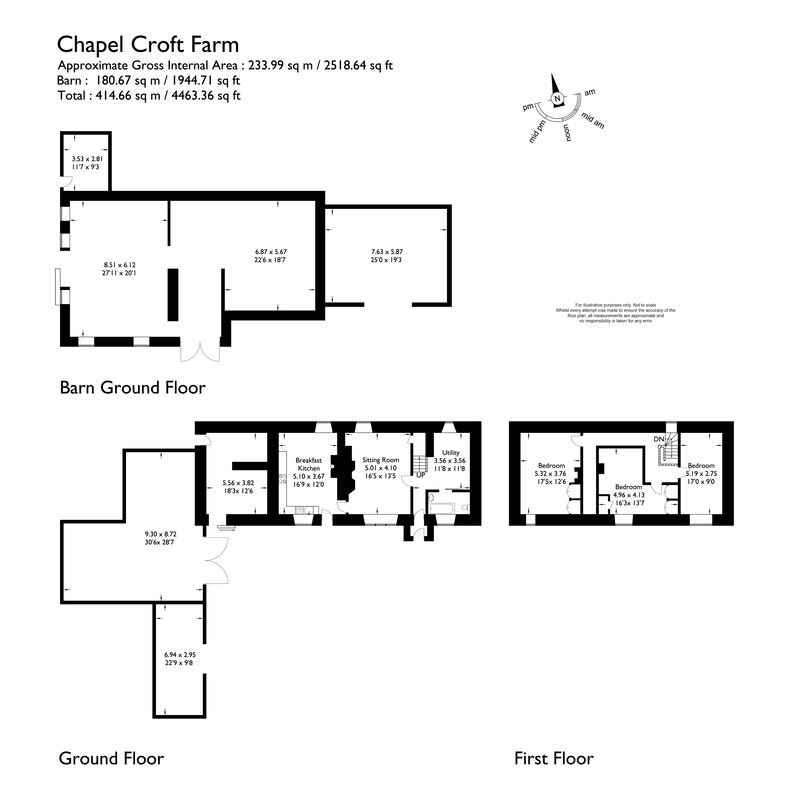 LOT 1: Chapel Croft Farm & Barn with approximately 11 acres of land: Guide Price £480,000. LOT 2: Adjacent land extending to approximately 12.4 acres: Guide Price £100,000. This property is being offered for sale by informal sealed tender, prospective buyers are invited to view the property and submit offers for Lots 1 & 2 either jointly or separately. All sealed tenders must be received by 12 noon on Friday 2nd November 2018. Tender Forms are available from the selling agents. Stone with external rendering, pitched blue slate roof supported on timber. Upvc double glazed window, range of fitted base and wall units with work surfaces single drainer stainless steel sink with mixer tap. Built in ‘Belling’ ceramic hob with hood. Multi fuel cast iron stove on raised hearth with timber surround. Double glazed window to rear elevation, original truss beamed ceiling. Double glazed upvc window with stone mullions and timber window seat. Double glazed sash window to rear elevation, open grate fire with tile surround and hearth. Original timber beamed ceiling, under stairs storage cupboard, fitted shelving to alcoves. Small single glazed stone mullioned window to rear elevation, fitted work surfaces, timber beamed ceiling. Three piece suite comprising panel bath, pedestal wash hand basin, low level w.c, single glazed timber window to front elevation, majority ceramic tiled walls, plumbed for washing machine. Return staircase with traditional handrail and balustrade. Timber double glazed window to rear elevation. Double glazed window to front elevation, fitted wardrobes, original cast iron fireplace. Double glazed upvc window to front elevation, original chimney breast, fitted wardrobes. Double glazed upvc window to front elevation. Constructed to the east elevation of the main house is a two storey stock building with first floor hay storage, doorways to front and gable elevations, two window openings to rear elevation, one window opening to gable elevation. Adjacent to the stock barn is a block boarded, lean-to garage facility with light and power installed. Attached the garage/workshop is a pre-cast concrete log storage with corrugated tin roof. To the east elevation is a small stone slate store room which is derelict. Detached stone barn with rendering to gable elevation suitable for conversion to a single detached dwelling subject to the necessary planning permissions and building regulations. Two good size pasture fields adjoining the farmstead, one with road frontage, extending to 11.07 acres, or thereabouts. A block of high quality meadow land within a ring fence with access directly onto Slaidburn Road extending to 12.447 acres, or thereabouts. 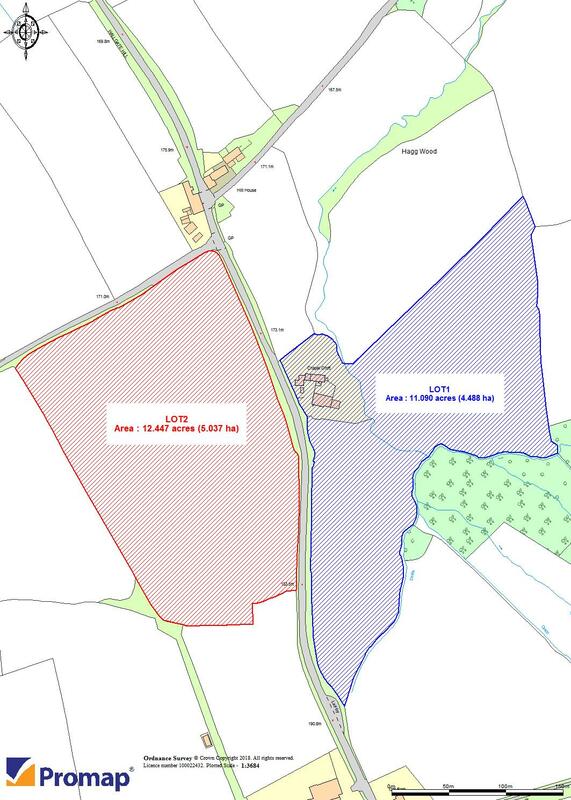 The land is situated in the corner of the junction of the Cow Ark and Slaidburn Roads. The property is approached from the main road through a traditional five bar gate to an open concrete parking and turning area. The purchaser is responsible for the fencing liabilities on the lots purchased. Mains electricity, sewerage to septic tank. Water supply: It is a requirement of the sale that the purchaser of Lot 1 will install, at their own cost, a borehole water supply for the benefit of Lot 1 and their own use only. The water supply to the trough on Lot 2 is via the Knowlemere Estate supply and a re-charge for water consumed will be made.